Judy Cinquina runs the Mount Peter Hawkwatch. She is a fabulous leader and she does an excellent write up at the end of each season. It’s an interesting read for sure and I’ve included a few recent raptor photos which I haven’t had a opportunity to post yet. Thanks so much to Judy for everything she does at the watch and for sharing her report. 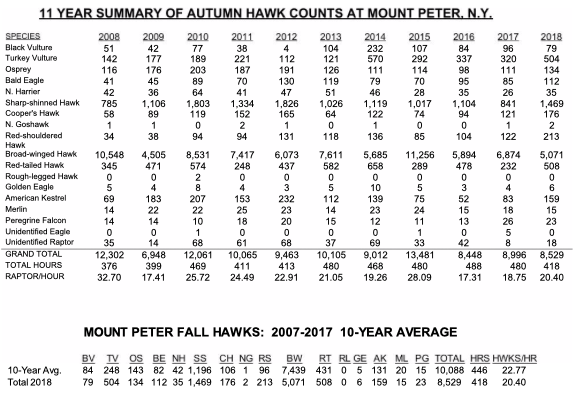 Twenty four days of bad weather shortened the 2018 Mount Peter Hawk Watch to 418 hours between September 1 and November 15, but produced a healthy 8,529 raptors, averaging 20.4 per hour. Highlights of the 74-day count included record Red-shouldered and Cooper’s Hawks, daily records for the Turkey Vulture and Red-shoulder and an encouraging increase in the once common American Kestrel. Results for the N. Harrier, however, remained depressing. 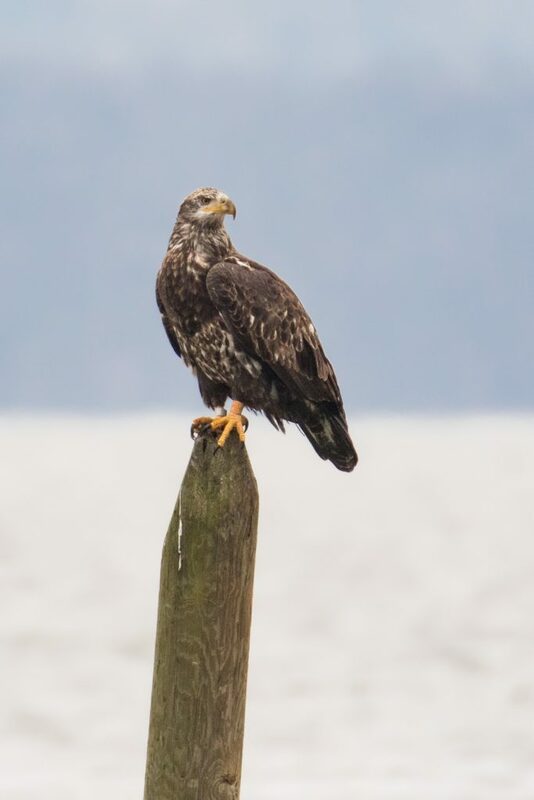 Although the Rough-legged Hawk failed to show up for the eighth consecutive season, Golden Eagles and Goshawks sprinkled a bit of glitter on our 61st season. September seemed a never-ending series of fog, drizzle, rain, heat and weak winds from the wrong direction, yet our 11 volunteer leaders persisted and ticked off 5,071 Broad-winged Hawks, most of them pepper specks at the edge of invisibility. Matt Zeitler drew the best day and counted 1,257 on the 22nd with a light NW wind. October, however, was kinder and graced us with a few record scores and rarities. The 213 Red-shouldered Hawks beat out our old record of 165 from 2012 (90 adult, 21 immature and 102 unknown). Most moved through between October 19 and November 4 on strong NW winds. 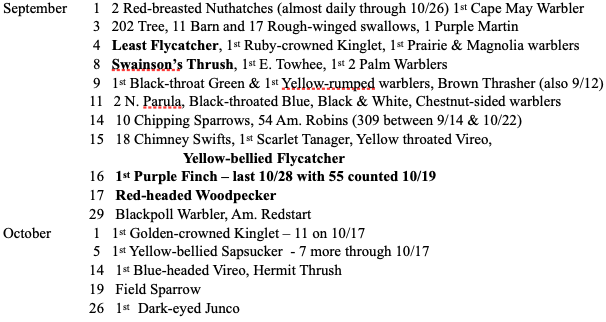 Just to be contrary, light S winds generated a new daily record of 28 Shoulders on October 26 for Denise Farrell. That wiped out the record 27 scored November 4, 2017 by Matt. This species has gone through low and high seasons for decades, but since 2012 has been on an upward swing. The 508 Red-tailed Hawks was an improvement over last season but a far cry from the record 905 scored in 2003. 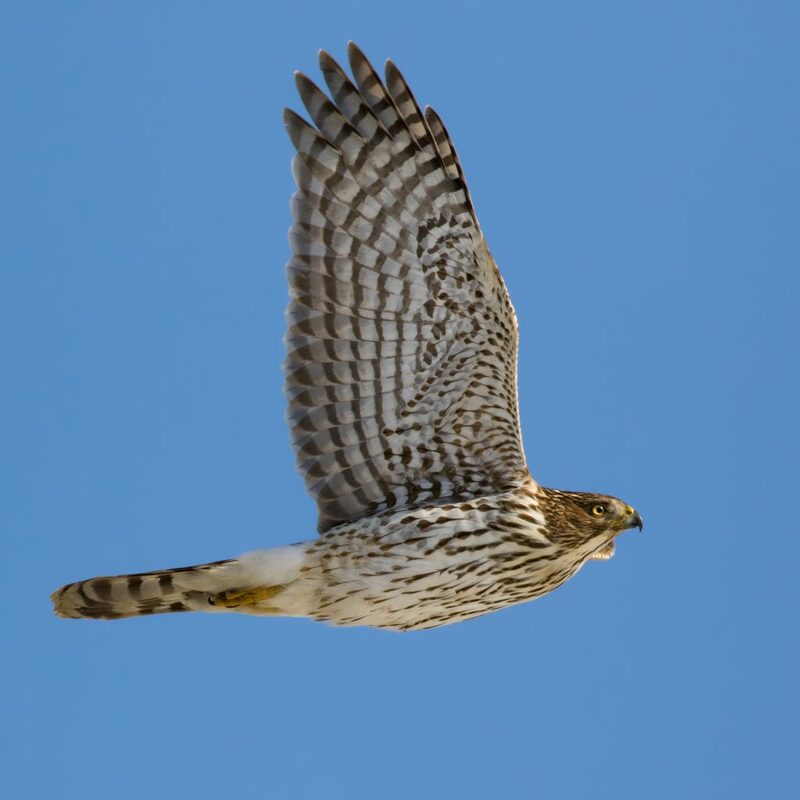 Nick Bolgiano wrote in the 2012 season’s Hawk Migration Studies –Vol. 38, No. 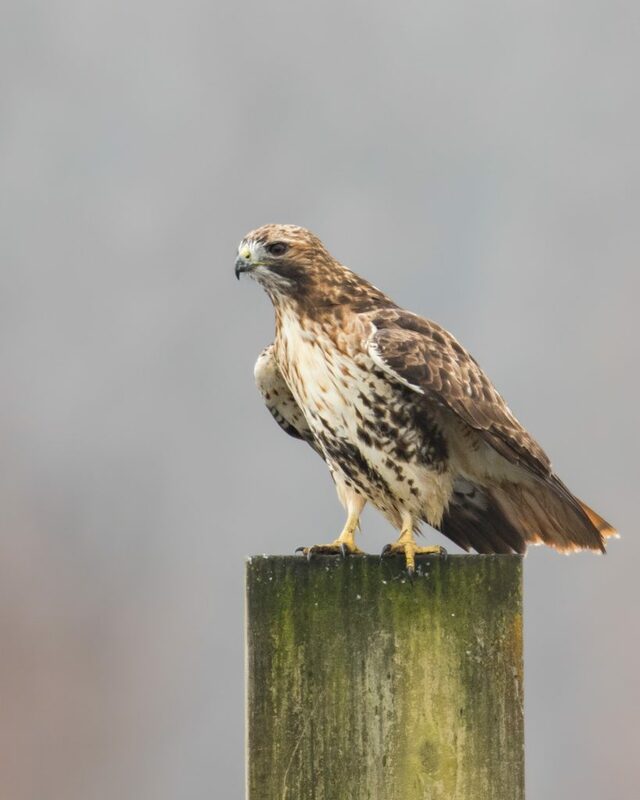 2 that Red-tails in the Kittatinny Ridge corridor are “short-stopping” or not migrating as far south as their ancestors or not migrating at all. In that same area Christmas Bird Counts have seen an increase in Red-tails. According to Bolgiano, the same thing holds for the no-show Rough-legged Hawks. The 1,469 Sharp-shinned Hawks was better than the 841 that graced the 2017 season, but remains part of a downward trend in the Northeast. Our only three-digit count was on October 12 with 173 on strong northwest winds. Their cousin the Cooper’s Hawks has been increasing, evidenced by our new record of 176 that squelched the 165 tallied in 2012. This species hit triple digit tallies beginning in 1990 and has been increasing ever since all over the Northeast. The much rarer Goshawk made two appearances this season. Both Ajit Anthony and Will Test bagged immature Goshawks, Ajit on October 17 and Will on November 14, on brisk west and northwest winds. Both Gos provided close views, and Will, who endured below freezing temperatures and howling 20 m/h winds, stated that the sighting warmed him up a bit. After three seasons of two-digit counts, the American Kestrel bounced back to a three-digit 159 ( 35 male, 27 female, 97 unknown). That’s good news for this little falcon, although it can’t approach the 592 totaled in 1981. Most moved through between October 12 and 24, a very late peak for this species. Denise garnered the best day with 41 on strong NW winds on the 12th, a day that produced many Kestrels all over the Northeast including 5,406 at Cape May. Mount Peter is not a falcon lookout, so the 15 Merlin, although a bit below average, were a treat, especially the three Tom Millard tallied October 30. Peregrines brought in our second best score ever, with 23 noted. The record 26 was made just last season, so this species is on the up-swing after practically disappearing in the 1960’s. Ajit Antony and Bill O’Keefe each scored three Peregrines on September 19 and 30 respectively. After five mediocre seasons, the Osprey produced a bit of a bounce with 134 noted but the tally remains under our 10-year average. Bill O’Keefe nabbed the best count of 19, September 20 on weak NE winds. The elegant N. Harrier barely made it over our lookout with a mere 35 spotted this fall (3 male, 9 female, 8 immature and 15 unknown). Bald Eagles came in at an above-average 112 (58 adult, 51 immature and 3 unknown). We also had 58 Bald Eagle visitors who weren’t counted and headed north. Sometimes a pair would entertain us, interacting and flirting and distracting us from counting real migrants. Others accompanied true migrants past the platform then headed back north. Matt Zeitler observed 10 on September 29 that weren’t counted, five of them adults flying north together. Six Golden Eagles were shared by leaders this season: 2 adult, 4 immature. Rick Hansen reported a young Golden appeared over the lookout at 8:45 a.m. November 10, sat on the updraft along the west side and stooped into the valley and disappeared. The next day, a young Golden almost slipped by to the east, where trees block our view but was spotted at the last second by Jeanne Cimorelli and Tomorrow Millard. We can’t thank our friends and visitors enough for their support, especially on high, blue days when even eagles were invisible to the naked eye or overcast days when the wind howled and every migrant shot like an arrow past the watch. A special shout out goes to Bill Connolly, John and Liz Sherry and Rob Stone for their many hours of spotting and company, and a big welcome to new leader Jeanne Cimorelli. Our 61st count was enriched by all of you. We our indebted to our clean-up crew Denise Farrell, Rick Hansen, Tom Millard and Gabriele Schmitt and to the Fyke Nature Association of Bergen County, NJ who supplied our insurance. Here’s hoping that the NYDEC Region 3 Foresters can do something about the trees that block our view of low migrants to the SE of the platform before next season and that the pot-holed dirt track to our lot can be improved. We our indebted to Fyke for sponsoring our count and to all who supported our site on Hawkcount.org. We continue as the oldest, continually run, all-volunteer fall watch in the country. Previous Previous post: Wow! Orange County NORTHERN SHRIKE!